Don Tillman is a man of science. He teaches genetics and organizes his whole life around routine, order, and scientific evidence. So when he decides he would like to get married, he creates a questionnaire that will be the basis for The Wife Project. Potential wives will answer the questions and he will be able to save time by weeding out the smokers, the ones who will always be late, and the ones who don't believe that fruit flavored ice creams all taste the same. But his scientific methods don't take Rosie into account - Rosie fails every question, but Don can't stop thinking about her. Is there something about compatibility that can't be quantified? The Rosie Project is consistently described as quirky. It's a love story that is different from the ones we usually read with strange but utterly endearing characters. Don narrates his own story and we get a front row seat into his very particular worldview. He has a prearranged meal schedule, so that his groceries are the same each week. He calculates your BMI as you talk to him and listens to Bach to figure out the patterns in his music. Rosie loud and brash and works as a "barmaid," a profession that Don finds inferior to his world of academia. While Rosie and Don are very unique characters, this book examines how all people approach relationships. Don realizes that he is not like everyone else. There are moments when he wishes he were more like other people, but there are also times when he realizes the advantages of his way of life. Do we change to make others happy? Can we hold onto the essence of who we are or does the very act of becoming a couple mean that we must evolve? Books like this one become literary forces of nature. Everyone is reading and raving about this book. It's great to read a story that is indeed as quirky and fun as everyone says, but it somehow leaves the reader wanting more. This story began as a screenplay and it feels very much like a romantic comedy. But because it seems like a movie, it doesn't feel like there are high stakes. In fact, there never seems to be any doubt that these two unique characters will get together. I wish we had felt more of the difficulty and uncertainty of a new relationship alongside the joy and the fun. 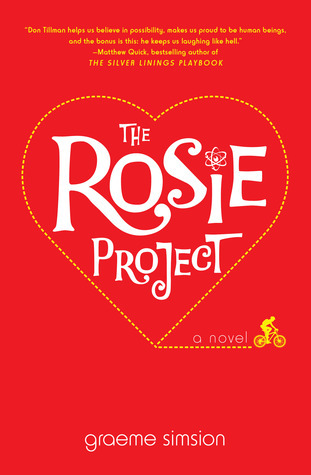 The Rosie Project is a quick, delightful read and a book that will make you believe again that happy endings are out there for everyone. I kind of pooped out on this one, but I think it's because I was reading it in small snatches before my son's bedtime, and I really need to sit down with it and blow through it in a day or two. I shall get back to it! Yup, I think this is one of those books you have to power through in a weekend! I have to admit, I tried to read this book, but didn't finish it. (In fact, I didn't make it past chapter 2.) It's such a cute premise; but I just couldn't connect with the characters. Glad you liked it, though. I did like it but I think I didn't love it because it was oh-so-cute. I can understand how you didn't connect with it! Nice review! I really liked this book because I sort of identify with people who are socially-challenged -- although my husband assures me I don't have any form of Aspergers, I don't always believe him. Either way, this book gave a lot of insight into how different people are, and how people who are "different" have strengths of their own. All that in a fun, light, romantic read. Yes, I liked how it highlighted the strengths that we don't always see in people. This is definitely a fun read! Great review. I loved the book, but your comments have made me look at it slightly differently. Still love it, just thinking about different things to do with it now.